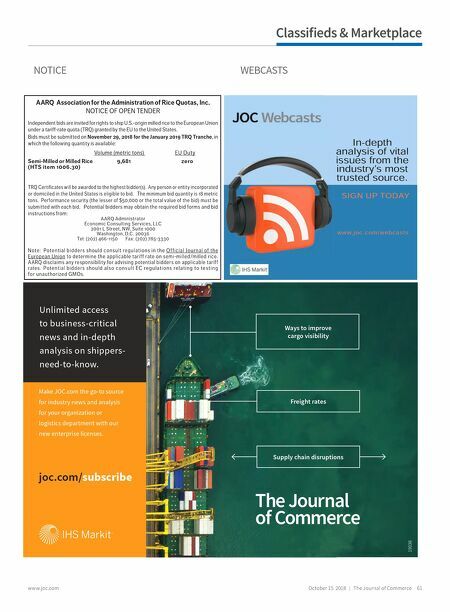 60 The Journal of Commerce | October 15 2018 www.joc.com By Colin Barrett Q&A Q A Proof of cause should determine liability We need help with a blocking and bracing issue. We received a freight quote from our shipping broker. Two loads were shipped by a major railroad, but there was damage. The carrier denied the claim due to improper blocking and bracing. The claim was for the $40,000 we lost; the product had to be destroyed since the cost to repack was more than the cost to do a new production. The commodity was water in a 16-oz. can packed in 24-pack case. The issue was black residue, abrasion, and dents on the cans. This was a new brand's first production. YOU'RE A LITTLE short of full information in your email to me, but you provided me with enough to say pretty conclusively that the carrier's declination amounts to a substance commonly found in cow pastures. I could at least see an argument that poor bracing and blocking could have resulted in abrasion and dents in the cans, both of which could conceivably have resulted from the cans banging into one another inside the cases as the cases shifted about in the railcar. But there remains the black residue you report. Where did that come from? No amount of bracing or blocking could have protected the goods from it, which casts the carrier's explanation into severe doubt as to the whole thing. I'll have to start guessing now, not being privy to information that the carrier either has or can get, but which you also probably don't have. But it strikes me that there's only one set of circumstances that fits the nature of the damage that you report. Let's hypothesize that your shipment was loaded in the same car as some other commodity, either solid or liquid and black in color, which is semi-soluble in water and will be carried along by water. Now, let's further hypothesize that the weather was inclement for some part of the journey (i.e., the railcar went through a rainstorm or passed through large puddles left by one), and that the car wasn't very watertight. And the final hypothesis is that for one reason or another the trip was unusually rough. In such circumstances, the containment of this hypothetical co-loaded commodity might have been breached, so that it wound up loose in the car, and the rainwater inside the hypothetically leaky car might have distributed it to other loads within the car, such as yours. The hypothetical rough trip also explains the dents in the cans, and our presumptive co-loaded commodity may have also been abrasive, causing the scratches and scrapes you report. OK, I acknowledge that this is an awful lot of guess- work. But can somebody come up with a better scenario to explain this concatenation of symptoms that you say you observed? I suppose the things you saw may have been unrelated, resulting from different causes, but that strikes me as even more far-fetched than what I've suggested. In any case, it's not your responsibility to identify what actually happened. 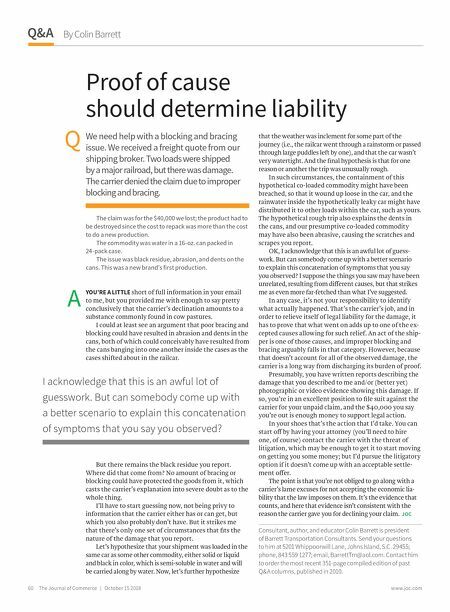 That's the carrier's job, and in order to relieve itself of legal liability for the damage, it has to prove that what went on adds up to one of the ex- cepted causes allowing for such relief. An act of the ship- per is one of those causes, and improper blocking and bracing arguably falls in that category. However, because that doesn't account for all of the observed damage, the carrier is a long way from discharging its burden of proof. Presumably, you have written reports describing the damage that you described to me and/or (better yet) photographic or video evidence showing this damage. If so, you're in an excellent position to file suit against the carrier for your unpaid claim, and the $40,000 you say you're out is enough money to support legal action. In your shoes that's the action that I'd take. You can start off by having your attorney (you'll need to hire one, of course) contact the carrier with the threat of litigation, which may be enough to get it to start moving on getting you some money; but I'd pursue the litigatory option if it doesn't come up with an acceptable settle- ment offer. The point is that you're not obliged to go along with a carrier's lame excuses for not accepting the economic lia- bility that the law imposes on them. It's the evidence that counts, and here that evidence isn't consistent with the reason the carrier gave you for declining your claim. JOC Consultant, author, and educator Colin Barrett is president of Barrett Transportation Consultants. Send your questions to him at 5201 Whippoorwill Lane, Johns Island, S.C. 29455; phone, 843 559 1277; email, BarrettTrn@aol.com. Contact him to order the most recent 351-page compiled edition of past Q&A columns, published in 2010. I acknowledge that this is an awful lot of guesswork. But can somebody come up with a better scenario to explain this concatenation of symptoms that you say you observed?